I recently spoke to Steppenwolf Theatre Company's Megan Shuchman about their long-standing and incredibly successful internship and apprenticeship programs. Both programs have some pretty impressive perks, from mentoring and professional development, to seminars and workshops at least once a month, to in-depth advice on resumes and cover letters. In the first installment of this two-part interview, Megan gives me a basic overview of the programs, their differences and similarities, and Steppenwolf's mentoring program. Megan Shuchman: Our professional leadership program basically consists of three smaller programs. The first and main one is our nine-month apprenticeship. It runs every year from September to May, and we hold an apprentice position in every single one of the departments throughout the theatre. Around 20 individuals in all end up being a part of that. It spans everything in our administrative office from development and fundraising, marketing, to our artistic department, and then it also crosses through our production departments, including production management and the technical aspects. We have people at all three of our locations, which includes our administrative office, our theatre, and then out in our scene shop. That nine-month apprenticeship is generally for people who have graduated college, but we get some people out of grad school as well, who are looking to take their first, early career step into professional theatre. The second subset is our three-month summer internship. Our apprenticeship, which is a paid position, is from September to May, and then the summer months are filled with unpaid summer interns. Those tend to be current undergraduates or grad students. And then we also have--new as of a couple of years ago--something called the two-year African American Fellowship. It's funded by the Joyce Foundation and has supported four fellows in total since 2007. Vault: Do the summer interns get the same overall perspective that the apprentices get? MS: Yes. I would say they get the same overall view. I mean, as you can probably guess, the apprenticeship is basically just much more in-depth than the summer internship. So, whereas the summer internship is going to let you get an overview or purview of whatever department you're working in, the apprenticeship is going to allow you to take that to the next level. But in both we do a lot of work to be actively mentoring and doing professional development work. We hold seminars in both, which are aimed at allowing participants to hear from different professionals in the theatre about who they are, how they came to Steppenwolf, what their job duties are and how they function within their department. And then they are also given resume and cover letter writing technique workshops. We do a networking in the business workshop. Those types of activities are the same both in the internship and in the apprenticeship. One difference with the apprenticeship is that participants in that program take on an independent long-term project. They work on the project throughout the nine months and it culminates in a presentation for the whole company. So usually in the first couple of months they're with us, they brainstorm a project that serves both the department where they're working and their own professional development. They pitch it to their supervisor and me; we sign off on it or we tweak it a little bit, and then they spend usually the remaining six months executing the project. We also try to make it so that the project is something they can take with them out of Steppenwolf--being able to talk about it at a job interview, have it as a part of their portfolio, that kind of thing. Vault: And are the seminars and mentoring and workshops throughout the program? MS: Yes, we do at least one a month for the apprentices. With the summer interns, because they're here for a shorter time, it's a little bit more frequent. It's also worth noting that for the apprentices, those seminars are all-day activities, whereas with the summer interns, we do them more frequently but just for a couple of hours at a time. Vault: What training and orientation do they undergo at the beginning of the program? MS: On the first day of the apprenticeship or internship, we do an all-day orientation, which includes basic orientation materials about their job and what is going to be required of them, paper work, goal-setting, that sort of thing. They also go on a tour of the whole theatre led by the production manager, who also explains some of the history of the building and of the theatre itself. Finally, we always do a meet-and-greet with our entire staff. Everyone on the Steppenwolf staff comes, gathers together in one of our big rehearsal halls, and each person says their name, where they work, and gives a welcome to the new intern or apprentice class. Usually there's then a greeting by our artistic and executive directors, and that's how we start the experience for our incoming classes. Vault: That sounds great. Interns get a full view of the company and each facet of the theatre. And if they're interested in one particular thing, they know where to go and whom to talk to about it. Going back to the seminars and workshops, how did those come about? How did you guys start integrating them into the program? MS: We've always had a version of them: you know, brown bag lunches, where everyone gathers, meets the incoming class and talks about the business. Then, at least three years ago, we decided to formalize that and make more of a seminar structure. Rather than having this smatter of lunches and guests in and out, we decided to really make it into more of a program...each seminar sort of builds on the one that came before it, and participants are able to see the outline of the whole seminar structure when they start. That way if, for instance, I work in the administrative office but I have a curiosity about scenic carpentry, I can look ahead and know that in a couple of sessions I'm going to get to go out and shop and meet with the scenic carpenters. So we really try to evaluate what kind of questions people have when they enter the program, and how we can create a comprehensive seminar structure that allows them to get all those answered. Then, once we'd built that basic structure within our own company of who would participate in the seminar and how it would be structured, we started involving a lot of outside artists. Vault: There's a lot of high-touch interaction with professionals in the theatre, and you mentioned earlier that you have a strong mentoring program. Can you tell me more about the mentoring program and the relationships between apprentices and interns and the Steppenwolf staff? MS: Yes. Well, it happens kind of on two different levels. First, there's the structured piece of the mentorship; every intern and apprentice is assigned a supervisor. In some cases that's a department head; in some cases that's a department manager or associate. It kind of depends on the structure and size of the department and, you know, the person who is most readily available to actively mentor that participant. So in that first day orientation, everyone is asked to fill out a goal sheet. And within the first two weeks, they're asked to sit down with their supervisor and go through the goal sheet and really talk through the things the supervisor feels are on the mark, and the things they want them to expand upon, etc. That's the first sort of formalized thing. We also ask all supervisors have at least bi-weekly check-ins with their apprentice or intern.... And then, both half way through the program and at the end, we do a pretty comprehensive evaluation in which the apprentice or intern is evaluated on their progress, and then they also evaluate the program at the same time. So those are the formal mentoring pieces. The informal mentoring pieces start with trying to help interns and apprentices to get to know as many people at our peer theatres as possible and as many of their fellow interns as possible. We also do things like ticket offerings with our peer theatres--free or really reduced tickets--and then we try to organize groups of interns and apprentices to go see them, both in an intern or apprentice group and/or with a couple staff members who are interested in going to that, and who can kind of lead the group and have dinner with them beforehand. 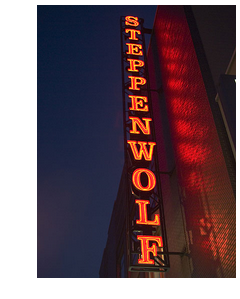 Also, a lot of people at Steppenwolf have theatre companies that they work with on the side, so they might be an artist who has an administrative job in the day, and a director, actor or designer in the evening. We try to give interns and apprentices the opportunity to help out or volunteer or get free tickets or work the box office at those companies--if they are interested, no requirement of course. Almost every single intern or apprentice jumps at the chance because it's more exposure. That's another thing that our staff really pride themselves on. "Someone did that for me, so I'm going to do that for somebody else." That mentality I think is really prevalent. We also have a lot of volunteer opportunities at the theatre: events that we work on in our fundraising department, events that we work on in our community outreach and education department, lots of chances to interact with the community on Steppenwolf's behalf. We always open those to interns and apprentices first, which is another way that they're getting informal mentorship outside of their department. Because I might be someone who works in the properties department, out of the scene shop--I'm working with the prop master and the prop artisan every day--but then I'm given an opportunity to come work a donor event at the theatre and so I get to come work with the event staff, with development staff, with a special event staff, and I'm getting to know all of those people and hearing about their jobs and understanding what they do while we work this event together. And I'm getting to know trustees and members of the community, who we consider to be a part of our family but who just do a very different job for the theatre. So I'd say informal mentorship in terms of exposure is the other side of the mentorship process. Stay tuned for the second installment of my interview with Megan Shuchman, when we'll discuss networking in the arts and how the recession has impacted Steppenwolf. 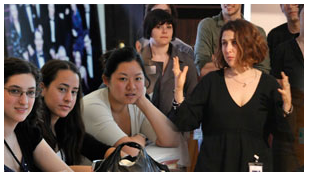 Steppenwolf Theatre Company is one of Vault's 2010 Top 10 Internships. And be sure to read the full Vault Steppenwolf internship profile. Interviewing: Should You Lie About Your Salary?